Essential Overnight Oats — Erin Parekh | Live Well, Simply. Have you tried overnight oats yet? If not, you should! 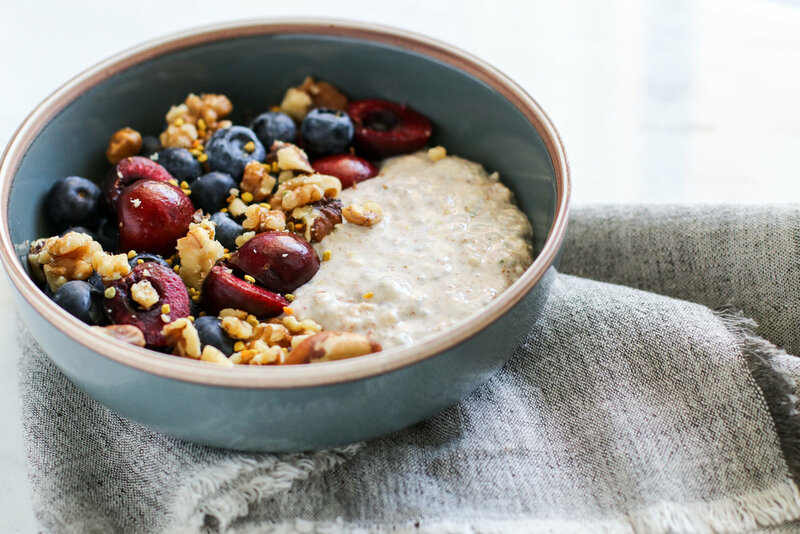 They're the easiest make-ahead breakfast out there - ensuring you have time for a nutritious and filling morning meal to power you through 'til lunch. Plus, the soaking process helps to breakdown the oats, making them easier on your digestion and their nutrients more readily available. Talk about a power breakfast. The base is simply rolled oats + liquid (milk and/or yogurt) mixed together in a small jar or bowl and left to sit overnight in your fridge. Pull it out the next morning, add any toppings you want, and go! The variations are truly endless, but here is my basic recipe to get you started. Mix ingredients together until well combined. Cover and let sit in the fridge for at least 2 hours, but overnight is best. Notes: My sweet spot for overnight oats is 1/2 cup cashew yogurt to 1/3 cup oats. Make ahead: For the best grab-and-go breakfast, make several individual servings on Sunday night. They will easily keep in the fridge for several days. Pro-tip: Make your overnight oats in an almost empty nut butter jar. Then you can scoop out the last little bits of nut butter with the oats. You're welcome.